America’s IndyCar team? Yes, he said, he liked that. He had not really thought of Vision Racing, which had just hired him to drive for it for the 2009 season, as America’s team, but now that it was mentioned, yes, he liked it. But, Hunter-Reay also said, whatever on the America’s-team thing. He is just happy this week to be getting ready to take to the track for the IndyCar Series’ opening event in the streets of St. Petersburg, Fla.
Because when the week began, his inclusion in the field, or any field this year, ranged from mere possibility to not happening. Hunter-Reay was a driver without a ride a week ago. Left car-less when Bobby Rahal’s team could not come up with funding for the 2009 season, Hunter-Reay faced the prospect of perhaps running for a Grand-American sports-car team or, geez, that was about it. Tough? You bet it was for a guy who has won races in the IndyCar, CART and ChampCar series. An explosion of activity early this week made things happen for Hunter-Reay. He was offered a full-time drive this year for the Vision team. Vision is co-owned by Indy Racing League-founder Tony George, whose family owns the Indianapolis Motor Speedway. 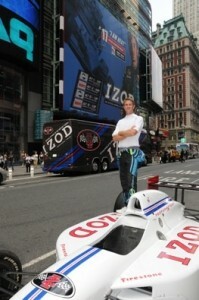 Also driving for the team is Ed Carpenter, George’s stepson. But Vision has spent the last couple years overcoming the whispers that it is little more than George’s plaything. It has gotten good on the track. The team is coming off eight top-ten finishes and four additional top-five finishes including a fifth place finish in the Indianapolis 500 by Ed Carpenter and a fourth place run by Paul Tracy at Edmonton. “With Ryan now joining Ed, we have a driver lineup that is more than capable of helping the team grow in its fifth season and capture the team’s first victory,” George said. One oft-leveled criticism of the IndyCar Series is the fact that most of the top teams are populated with foreign drivers. And the fact is, only once in the last six seasons has an American won the series’ driving championship. Hunter-Reay said that the best driver should win the championship, no matter their place of birth. But he also said it sure would be nice to give American fans just a little something more to cheer for.